Pontoon is a British reinvention of the game of blackjack. This has accumulated a number of loyal fans on the land and even on the internet. Some rules are similar to blackjack but of course there are some few twists on this variant so it is very challenging and special as well. This can be played by 2 to 8 players. The 8 players will play with 2 card decks. The card values are similar to the game with the ace having double values of 1 or 11 and the face card having the value of 10. 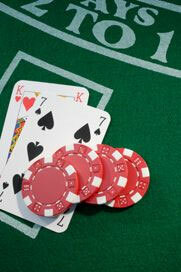 The premise of the game is to reach 21 and beat the dealer by having the value closest or equal to 21. In this game, the banker has a number of advantages. He can win ties and he can also sell his seat. The banker first makes the deal with the cards facing downwards. A card is given to each player. The left player first gets the card and so on. The banker is the only one who can view the first cards of the player. The second card is handed and if the Pontoon is on the side of the banker, then the game is over. 2 cards that are similar can be split. Buying cards can also be done. 3 cards can be bought. This can increase the stakes and double the bet that the player placed. When you make a second purchase, the player will raise a bet that is not as big as the previous one and that goes to the 5th. You can twist when you buy the cards but you cannot split once you bought the cards. You can stick at any point if the total is greater than 15 and if it does not exceed 21.